Aude is one of France's most underexplored departments, in spite of boasting two UNESCO World Heritage Sites, a rich history and some of the most beautiful sunswept green landscapes that France has to offer. Known by many as "Cathar Country", the region was once the hotbed of a medieval spiritual revolution - a revolution that was radically egalitarian and liberal by medieval standards - and many of her greatest attractions stand as monuments to this troubled time; from the ruined mountaintop castles of the Pyrenees to the walled fairytale city of Carcassonne. 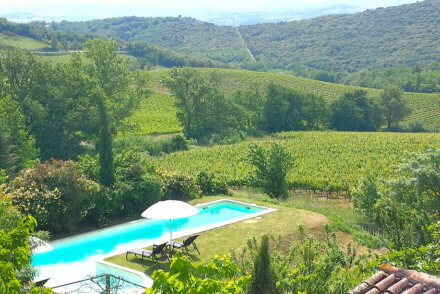 An area rich in vineyards with great hiking spots and numerous cultural spots; our collection of the best places to stay in Aude are perfectly placed to access all this region has to offer. The revolution of the Cathars might well be one of the most unsung moments of medieval history. From the 12th to the 14th centuries, radical preachers began denouncing the corruption and decadence of the Catholic Church. Jews and homosexuals were tolerated; women were given equal status to men; the material world of money and power were shunned in favour of simplicity; contraception and suicide were relieved of their sinful statuses and the eating of animals was considered morally wrong due to their belief in reincarnation. Naturally, they were mercilessly hounded by both the Church and the Kings of France, and in a series of genocidal wars known as the Albigensian Crusade, their movement was tragically drowned in the backwaters of history. The castles, towns and cities in Aude stand as bleak and beautiful testaments to this violent past. Carcassonne, for example, the walled fairytale city, was besieged during these struggles and the population was utterly decimated. One of France's most visited castles, she is said to have inspired Walt Disney's Sleeping Beauty. Visiting Carcassonne is a must: boasting gorgeous panoramic views of the New Town and the surrounding lands, the walled castle is as haunting as it is beautiful. As you walk beyond the walls you are buried in the sound of medieval plainsong. In the centre of the old walled part of town, you are surrounded by lovely restaurants serving the local delicacy Cassoulet, a beef or mutton-based bean stew. Narbonne, the other major city in Aude, is more vibrant and less touristy than Carcassonne, though it does have some fantastic museums to feast your eyes on. Formerly a Roman town, it has some delightful street markets, chic boutique cafes and gelato shops. The sights-to-see are plentiful; the enormous cathedral is a marvellous example of early Gothic architecture and is as yet still unfinished, having been originally constructed in the 13th-century. The Archaeological Museum is a treasure trove of archaic artefacts, from Bronze Age swords and arrowheads to marble busts of Roman emperors. The countryside of Aude is gorgeous. Sunswept and green, filled with vineyards sweeping off into the pale blue horizon of the Pyrenees, it boasts some brilliant hiking spots too. Get yourself to Duilhac, a tiny village in the bosom of the French Pyrenees, and walk the Cathar trail to the mountaintop castle of Peyrepertuse - 800m above the region's vineyards - and marvel at the stunning views. Inhabited since the days of Rome, it was used as a Cathar hideout during the Albigensian Crusade and makes for a tiring but extremely rewarding walk. For something more relaxing, hire a canal boat and gently float down the Canal du Midi. At different junctures, there are lovely little fish restaurants that are ideal for a spot of lunch after a day on the canal. Museums: Narbonne has some great museums. For a rich and varied experience, check out the Archaeological Museum for its treasure trove of findings from the Bronze Age to Late Antiquity. Churches: the Cathedral of Narbonne, a gigantic and haunting Gothic building originally built in the 13th-century, is a must-see. Historic sites: the medieval walled Old Town of Carcassonne seems to have been pulled out of the pages of a fairytale. Utterly spellbinding, it has an extremely well-preserved castle and some gorgeous views from the walls. Outdoors: if you like hiking, consider making the long, tiring but very rewarding journey up the Cathar Trail to the top of the mountaintop castle of Peyrepertuse. 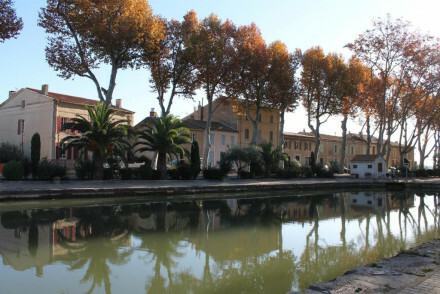 Or for something more relaxing, hire a canal boat and gently meander down the Canal du Midi. To be sure you bag a spot at one of the best places to stay in Aude we recommend you plan your trip well in advance. Hotel du Chateau: set within the ramparts of Carcassonne's castle, it has an old medieval exterior and delightfully contemporary interiors. Pamper yourself in the spoiling spa, unwind on the terraces or in the swimming pool. Pure indulgence. 42 Rue Victor Hugo: a beautiful boutique B&B offering 3 apartments with high ceilings and fireplaces, close to the major sights of Carcassonne. 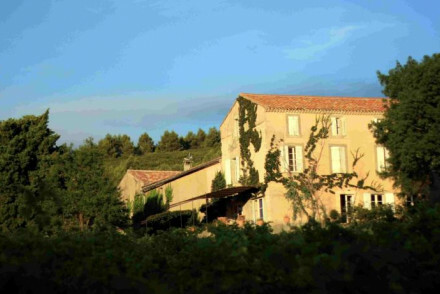 B&B Demeure Saint Louis: a charming 18th-century guesthouse on the outskirts of Carcassonne, offering 5 elegant rooms decorated in a traditional style. Ideal for local exploring. La Bastide Saint Martin: a picturesque sandstone country house with gorgeous sky-blue shutters, offering 15 traditional rooms, an outdoor pool and a sundeck. A great little country escape! La Fargo: set within a rural paradise of orchards and rivers, this delightful hotel offers 12 simply-decorated rooms. Ideal for large families. Chateau des Ducs de Joyeuse: a gorgeous 16th-century turreted castle with 35 elegant rooms, a restaurant with vaulted ceilings and a swimming pool. Ideal for exploring the local Cathar castles. Chateau de Gramazie: set within a gorgeous building that was once a 9th-century abbey, it offers 12 elegant rooms and a delicious gourmet restaurant. Amazing value for money! 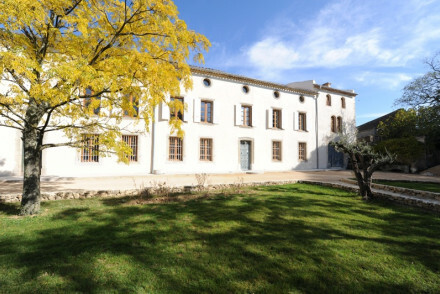 La Bastide Cabezac: standing between Narbonne and Minervois, offering 12 traditionally-furnished rooms. There is an outdoor pool, sun-terrace and a restaurant serving excellent regional fare. Hotel de la Cite: romantic and spellbindingly beautiful, this gorgeous hotel stands within the walls of Carcassonne. A fairytale-like building offering 61 elegant rooms, a swimming pool and a Michelin-star restaurant. Pure luxury. 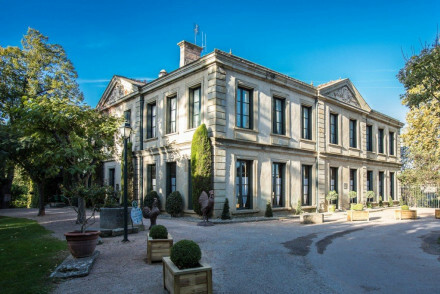 Le Domaine d'Auriac: a magnificent property set within a blooming garden, only 10 minutes from Carcassonne, offering 24 rooms decorated in a classical style. Boasting a Michelin-star restaurant and a golf course. A spoiling and regal stay. For something self-catered we recommend you search through the options on our partner Booking.com's site which has a wide range of villas and apartments in the nearby area. The best time to go is during the summer months: between May and June, the climate is warm and full of sunshine, while July and August are hot and dry, with temperatures averaging at around 30 degrees. Fly to Carcassonne Airport and then take a taxi or a bus to your destination. Expand your search to include all our properties in neighbouring Pyrenees-Orientales. 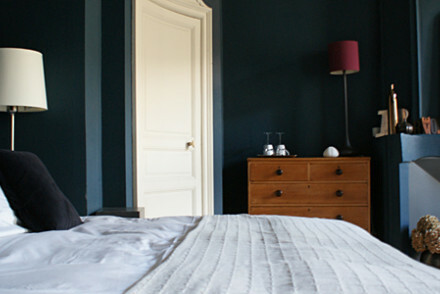 Alternatively, search through the best places to stay in France. 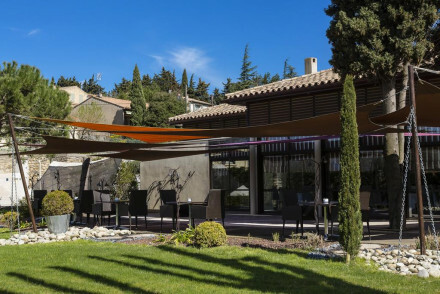 A charming hotel between the plains of Narbonne and Minervois. Rooms are traditional with stone floors and cream drapes. 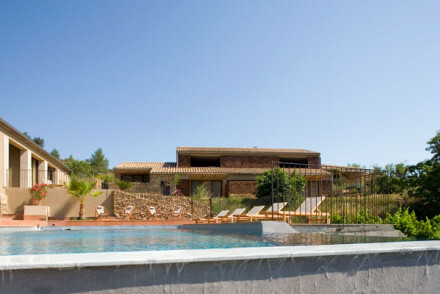 Outdoor pool, gym, sunny terrace, and excellent Mediterranean cuisine. An authentic, quiet, and good value spot. This tastefully converted chateau, once a 9th Century Abbey, has 12 elegant contemporary rooms, including 2 family suites. The restaurant serves good classic French cuisine made with quality local products and accompanied by the best wines of the region. A chic retreat after a day exploring. This charming, rural British-owned farmhouse offers stylish self-contained accommodation. Ideal for families and small groups wanting a comfortable base from which to explore their environs. Open March to October. Great walks - Excellent walking routes in the surrounding wine country. Local markets - Explore the bustling local market of Pomy. Stunning ivy covered country house with an excellent restaurant. Bedrooms, suites and family rooms with four poster beds, fireplaces and tapestries. Beautiful grounds and terraces, swimming pool, billiards and a tennis court. Great for families, groups, and foodies. Excellent value. 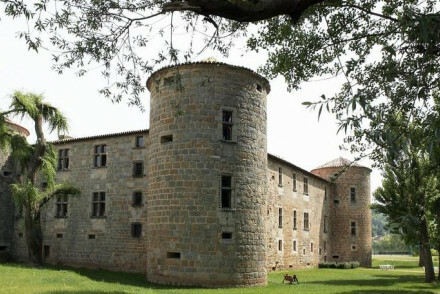 A gorgeously rustic stone farmhouse B&B just outside Carcassonne. The perfect spot for a more relaxed holiday for families, groups of friends, or romantic getaways. Three simple rooms and two cottages. Very charming. A hideaway in the hills of Languedoc. Striking sandstone French house with green shutters and understated modern interiors. Big bright rooms and one family cottage. Lots of outdoor activities in the surrounding hills, lakes, and beaches. Excellent value, perfect for groups or families. 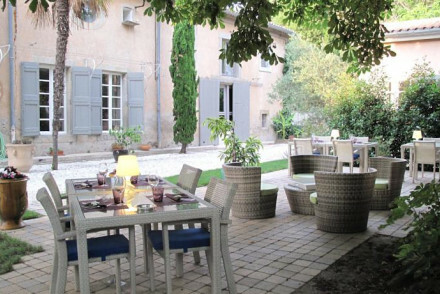 Award-winning boutique guesthouse near the Canal du Midi. Rooms are spacious and light with high ceilings, sash windows and soft hues. Take a picturesque cruise on the canal, tour the local vineyards or hire a bicycle to explore the region. Writing a novel - Each room comes with a writing desk, but the pull of the region lies in its dramatic, idiosyncratic and violent history. Sights nearby - Carcassonne, the picturesque fairy-tale fortified city, is only a 30 minute drive away and was the Cathars' stronghold. Sailing - The hotel organises cruises along the Canal du Midi. A pretty sandstone country house with blue shutters. Rustic rooms and family suites with stone floors, wooden beds, and doors that lead into the garden. A luxurious swimming pool and sun deck for lounging. Ideal relaxation for families, groups, or couples. A rustic-chic farmhouse renovation in a peaceful orchard. Large simply decorated bedrooms with white washed walls and exposed stone. Huge swimming pool, terraces, rivers and orchards for strolling in. A relaxing rural retreat, great for families too. Elegant chateau-castle with stunning grounds near the riverside, like something from The Lady of Shallot. Elegant high ceilinged rooms and suites with four poster beds and fireplaces. Perfect for groups, families and weddings. Sights nearby - Plenty of Cathar castles and much more to choose from. 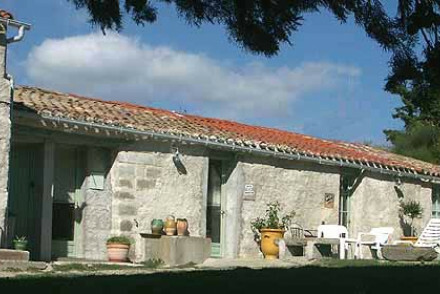 A serene countryside retreat just a short drive from Carcassonne. 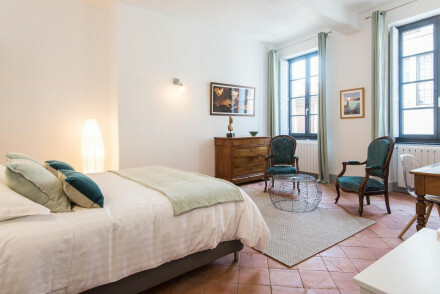 Charming bedrooms with authentic terracotta tiled floors and lime washed walls. Plus a peaceful garden with plunge pool for ultimate relaxation. Casual and laid back, on a stunning wine estate. A colourful B&B hotel. Unique rooms are decorated in contemporary style with dashes of colour and modern bathrooms. Charming terrace with hot tub. Library area to relax in. Plethora of sights and trips in the nearby region. Quickly find yourself at home in this great value hotel. A large 19th century stone house in the historic centre of Carcassonne. The charming hosts provide a generous breakfast and there is a relaxing terrace and pool area for lounging about in the sun. 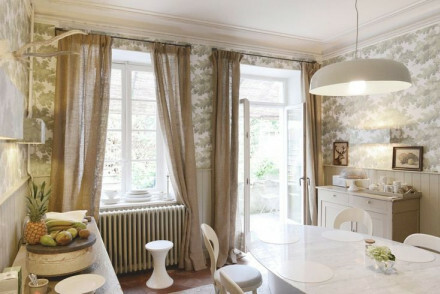 Tasteful rooms have whitewashed walls, antiques and large sash windows. A stylish base. A beautiful white stone castle with a house party feel. Simple, modern rooms and suites with wooden beamed ceilings and white washed walls. Great restaurant, extensive gardens with a swimming pool, and a spa. A great choice for families or groups of friends. 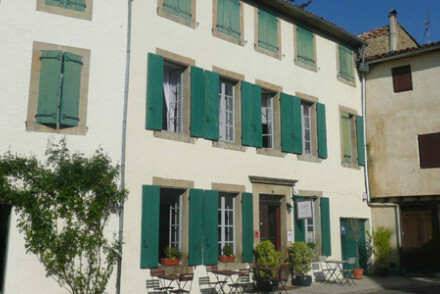 This pleasant B&B is nestled in beautiful French countryside offering views of Carcassonne and the Pyrenees. The charming rooms feature antique wood furnishings, exposed beams and old-stone walls. Offering a continental breakfast and a pool and hot tub set in the quaint garden. A beautiful location. 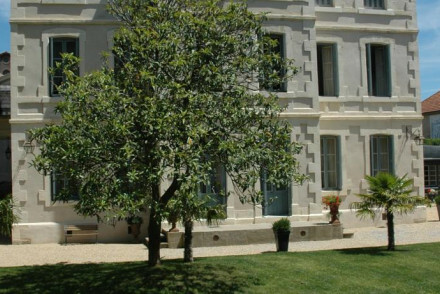 A stunning 18th century guesthouse, just outside the medieval city of Carcassonne. The spacious and comfortable rooms are traditionally decorated and boast en suite bathrooms. Enjoy breakfast in the elegant dining room, or in the leafy garden- perfect for sitting out and enjoying the weather. Local exploring - Only a ten minute walk from the ancient walls of Carcassonne's medieval centre. 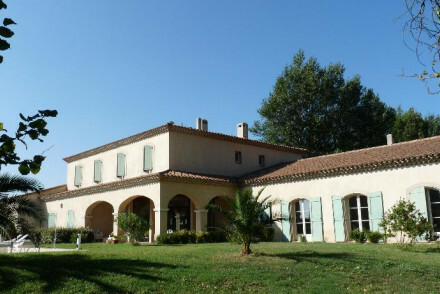 Total relaxation - Enjoy the stunning garden or take a long walk around the ancient citadel. 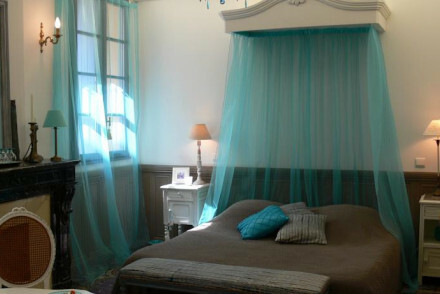 Charming and stylish boutique B&B in picturesque Montreal, 20 minutes from Carcassonne. Five unique rooms exude rustic French charm and feature quirky art and marble fireplaces. Delicious homemade breakfast in the morning. Tranquil courtyard with swinging basket chairs and mint bushes. Gorgeous B&B with three huge boutique apartments. High ceilings, richly painted walls, parquet floors, and fireplaces. A sumptuous spot with self-catering options and close to restaurants, markets, and the sights of Carcassonne. A charming small property comprising of just five brightly decorated rooms. Dine on indulgent home cooked dishes served on the sun-drenched terrace. Spend time with the ever friendly owner or simply unwind by the pool. A small spa is the icing on the cake. Rural france at its best. Total relaxation - A small property with a wonderfully friendly owner where days can be lost in good food, wine and total rural tranquility. Sights nearby - Visit the striking medieval citadel of Carcassonne only 8km from the property. Medieval exteriors and contemporary interiors at this chic hotel within the castle's ramparts. Rooms and suites with vaulted ceilings, exposed stone, and rich silk fabrics. Enjoy indulgent pampering from the spa, and relax on the terraces or by the swimming pool. Sights nearby - Located next to the chateau in central Carcassonne. Walking distance to all the major attractions in the city. Utterly romantic, utterly unique. 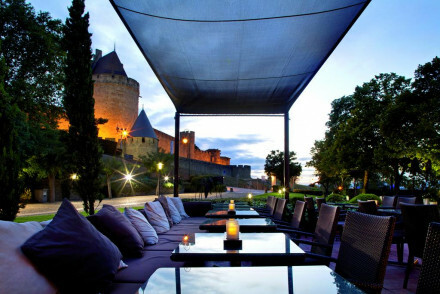 A hotel nestled in the ramparts of Carcassonne's citadel and surrounded by beautiful gardens. A fairytale building with turrets, exquisite bedrooms, a Michelin star restaurant, and a swimming pool. A special spot for anyone who can afford it. Outstanding location - Atop the medieval walls of Carcassonne. A contemporary hotel located just outside the medieval city of Carcassonne. Chic accommodation offers expansive glass sliding doors leading onto a private terrace and garden along with every modern luxury. The restaurant is the real star of the show however, boasting two Michelin stars. Foodies - Housing a two star Michelin restaurant which offers innovative modern French cuisine. 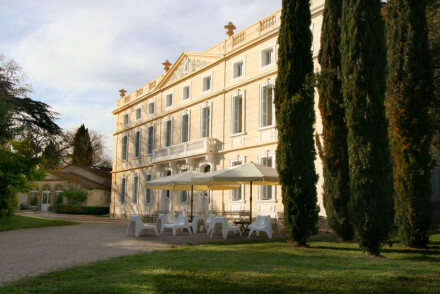 Sights nearby - Visit the Chateau Comtal, an expansive castle dating back to the 12th century. Previously an inn and museum, this slick hotel overlooks the fortified walls of Carcassonne and fits into the city's ancient heritage. 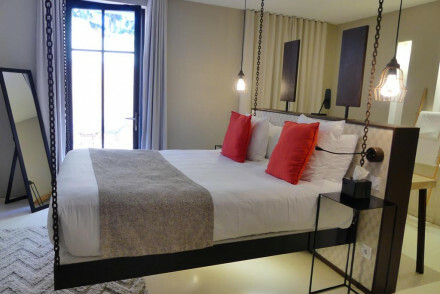 The rooms have an edgy modern decor and come with en suite bathrooms. There is an outdoor pool and buffet breakfast served daily. Perfect for visiting Carcassonne. 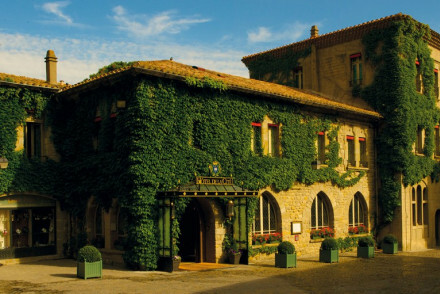 A luxury hotel set in a tranquil spot just minutes from the medieval city of Carcassonne. Elegant rooms are classical in style with floor to ceiling windows, floral motifs, high ceilings and antiques. Boasting both a golf course and a Michelin starred restaurant, this is an indulgent break. Foodies - Housing the Bernard Rigaudis Restaurant which holds a Michelin star and serves undeniably fantastic regional cuisine. Golf - Play a round on the hotel's own 18 hole course. Great walks - Explore the surrounding vineyards on long walks starting straight from the property. Sights nearby - Visit the Chateau Comtral dating back to the 12th century.